abstract Getting started with Sahi Pro Desktop Add-on Automation. Java 1.6 or above is needed for running Sahi. 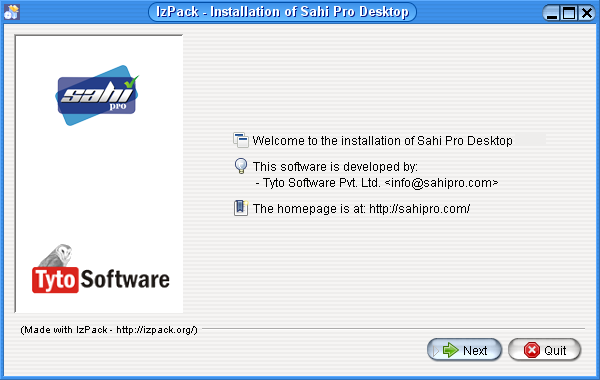 Download Sahi Pro and Sahi Pro Desktop Add-on from Sahi's download archives. Install Sahi Pro into a folder without spaces in its path. Then install Sahi Pro Desktop Add-on into the same folder as Sahi Pro. 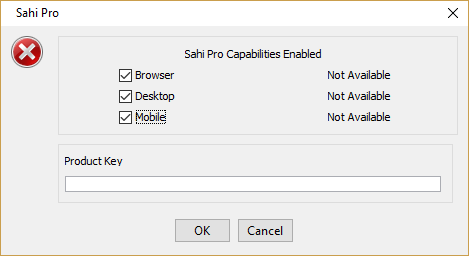 Sahi Pro Desktop Add-on needs a separate license from Sahi Pro. You will need a valid license to run Sahi Pro Desktop Add-on. If you do not have a valid license yet, you can register here for a 30 day evaluation license. If you wish to upgrade from an older version of Sahi Pro Desktop Add-on, please refer to Upgrade for details. Double click on install_sahi_pro_desktop_xxx.jar to start the installer. If Java is configured properly, it will launch the installer. infoSahi Pro Desktop Add-on must be installed in the same folder as Sahi Pro is installed. For example, if Sahi Pro is installed at C:/<username>/tools/Sahi_Pro, then install Sahi Pro Desktop Add-on also at C:/<username>/tools/Sahi_Pro. Add Product Key directly from with Sahi product key popup window. Sahi Desktop Add-on needs valid Product Key to be available inside userdata\config\productkey.txt (create if needed). If the Product Key is valid, Sahi will startup fine and you will be able to access Sahi. infoSince Sahi Pro v7.5.0, there is no need to have Sahi Pro license for the automation of Desktop applications only. Sahi Pro Browser capability can be disabled by unchecking the Browser checkbox. One needs to add Product Key based on Sahi capabilities enabled. warning Browser Icons will not be present on Sahi dashboard, if Sahi Pro Browser Capability is disabled. info if Sahi Pro Desktop Add-on is installed at correct location, Desktop IconandStart SahiWin exe linkwill automatically appear on Sahi dashboard. Sahi Pro Desktop Add-on provides support for Windows and Java applications. Overall usage of Sahi Pro remains the same. The _setMode API allows switching between different modes like Browser, Desktop, Mobile etc. in a single script. If you are not familiar with Sahi Pro, please go through the Sahi Pro Quick Tutorial.